There will be packet pickups at Fit2Run in St. Pete and Tampa the weekend and weeknights before the race, as well as on race morning. See the packet pickup schedule here. Fort De Soto Park is located at the southern end of Pinellas County and easily accessible from any direction. From Interstate 275, watch for signs for the Bayway, which connects St. Petersburg and St. Pete Beach. Head west towards the beaches, turning south to Fort De Soto Park. 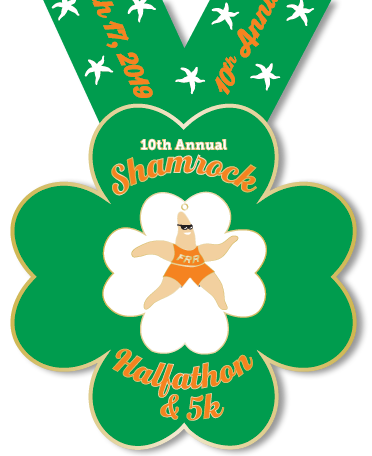 Put on your green and celebrate the arrival of spring at our Florida Shamrock Halfathon, 10K (new!) and 5K, located at Fort De Soto Park, near St. Petersburg on Florida’s beautiful west coast at the mouth of Tampa Bay. Fort De Soto’s beaches are regularly recognized as one of the nation’s best. Both our courses are located entirely in Fort De Soto Park, starting and finishing at the park’s North Beach. These races will be run on paved access roads and recreational trails; no running on the beach. Finish line treats will include fresh fruit, hot pasta, cold Coronas, and live entertainment. Conquer the Florida Halfathon, 10K or 5K Challenge or complete the Triple Crown during our 2019-20 season and earn a beautiful Challenge medal and/or Triple Crown medal plus your finisher medals – up to 7 medals in all!